Viewable with a VR viewer, Axel Straschnoy’s VR film Detective (2017) takes us on a journey through Kiasma’s newly opened ARS17 exhibition on how The internet and digitalization have radically altered our everyday lives. In Straschnoy’s VR film the art and our whole experience of the exhibition are somehow radically different than in real life, however. What has happened? And what does it mean for us to experience it here in Malmö? ARS17 is a major exhibition of international contemporary art on the theme of digital revolution. The exhibition will showcase artists of the new millennium and offer a fresh approach to contemporary art by also expanding the viewing experience into the online realm. Read more about ARS17 here. To an ever-growing degree, we observe the world through a varied array of mediating technical devices. This fundamental reality is a key impetus for Straschnoy’s film. The work unfolds like a detective drama, exposing how technology alters our perceptions of reality and what happens when more and more instruments intercede between people and the real world. The work is partly inspired by the digitalization of the British Library’s newspaper archives in 2014. To protect fragile hard copies of historical newspapers, the library provides digital and microfilm copies – the original newspapers are no longer accessible to lenders. Straschnoy questions what happens when our physical contact with material objects decreases or ceases altogether and we only ever encounter representations and replicas. Virtual reality is an immersive environment, continuing a tradition dating back to the 1800s. The precursors of VR – the stereoscope, the camera obscura, the kinetoscope, motion pictures and theme parks – are likewise designed to create a totally immersive experience and a faithful facsimile of reality. 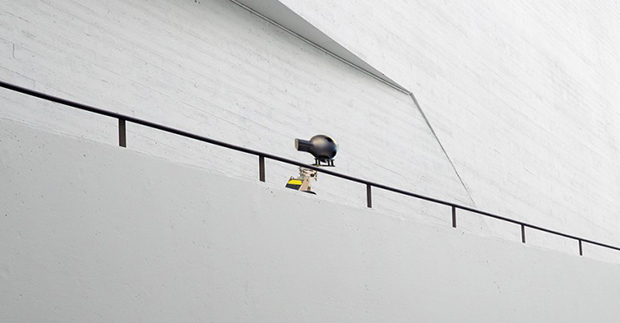 The work was commissioned by Kiasma for ARS17+. Read more about ARS17 here. With the support from: The Promotion Centre for Audiovisual Culture (AVEK), Quadion Technologies, Oskar Öflunds Stiftelse, Finnish Cultural Foundation and The Arts Promotion Centre Finland (Taike). The work is produced by Kolme Perunaa.